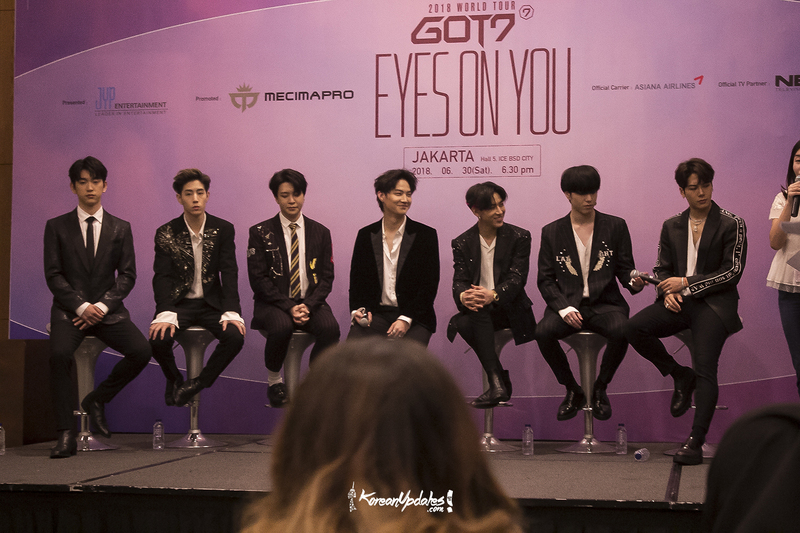 GOT7 back for the third time in Jakarta, Indonesia. After the previous GOT7 Flight Log: Turbulence Jakarta fan meeting in 2017, the JYP boys finally held a bigger event: Eyes on You World Tour concert in ICE BSD, Indonesia. The members has already traveling to Bangkok, Macau, Moscow, Berlin, Paris, and Taipei for the world tour and will fly more to Toronto, Los Angeles, Houston, etc. Before the concert, KoreanUpdates and other media press got a chance to attended their press conference in Garuda venue, ICE BSD. How does it feel to come back to Indonesia for the 3rd time? Since you already have been here three times, but only came to Jakarta, are there any places or cities in Indonesia that you would really like to visit? Once again, this is your 3rd time in Indonesia. Please tell us your Indonesian favorite food? What is your memorable memory of Indonesian fans? What are you expecting for tonight show? BamBam: First thing, Indonesia has a pretty hot weather. So, it similar to the energy of Indonesian fans, hot. I really impressed with Indonesian fans. So much fun! This time, our concert will have more upgrades, so I hope that fans in Indonesia will also enjoy it well. What is in your mind when many fans came to your concert and singing along with you guys? You guys has been in music industry for a while, please share your favorite moment? Are you guys have music genre that non of you have tried, but you want to try and hope to in the future? JB: There are so many music genres that we’ve never tried before, really many. But I think the thought is, if there any music genres that came to us, and how we interpret or express it to our fans in our own way, that would be better. You guys just came back from Europe, and some other part of the world, as part of the world tour. What do you like the most from the world tour? Jackson: I…. would like to give this chance to Jinyoung! Jinyoung: Of course we can travelling around the world and held a concert, that makes us really happy. But, in our mind, we never thoughts that we can held concert from Europe, and then go to Indonesia, this is something wonderful. Our airlines miles also… enormously accumulated. Then… hmm… (laugh) maybe this is something not necessary to tell you..
Jinyoung: Well.. hmm.. So, the point is we can travel all around the world and get many experiences from various countries, that is something really priceless. Are there any goals that you want to achieve this years? Yugyeom: We want to give the best of us to our fans, of course, from the music and performances. We’re not put something as our target, because all of us, we didn’t know how far or how long that we can grow, because there is no limit. Jackson: Can you guys understand if I answer this in Korean language? JB: So, for tonight concert, we hope that our concert will running smoothly, and of course this world tour over all can finish well. We feel really happy to come here, learning the cultures, what the country is like. We feel really happy, please look forward for our concert, in a moment.